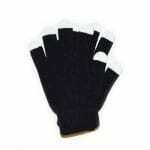 **This is a super durable microlight glove set assembled in the USA, not a cheesy prewired set from china! *note: 8 Fingers light up on this LED glove set. Pictures may vary from actual colors. Have you imagined what it would to have light shoot from your hands (I know I have). Unfortunately, the likes of light projection have not come into fruition; there are other ways to create that effect. One of the more efficient products from GloFX is their rave gloves. These gloves will put light at your fingertips. These gloves in particular will give you a variety of lights that certainly shine at any party. If not for that, these gloves are a very interesting accessory. They are great for kids and children to. They are getting very popular, and GloFX has the best quality and price.